Elizabeth Schulte reports on the election defeat of a sexual predator and reactionary. Your sexual predator endorsee for Alabama senator went down the tubes last night–and literally rode out on the horse he came in on. And, oh yeah, the women you sexually assaulted and then called “liars”? They aren’t going away. They held a press conference this week, and they want Congress to do something about your crimes–and, yes, they are crimes. In a down-to-the-wire election, Alabama Democrat Doug Jones defeated Bible-thumping sexual predator Republican Roy Moore in a special election Tuesday to fill the Senate seat left open by Jeff Sessions when he became attorney general. But the big winner in this election is the women of #MeToo–who broke the silence about sexual harassment and assault committed by powerful men. 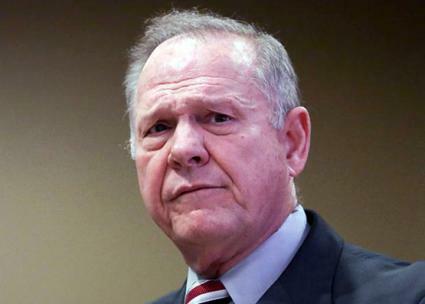 Moore’s fanaticism in the service of hate and reaction is well known–he was drummed out of the state Supreme Court for his statue of the Ten Commandments, and he defied the U.S. Supreme Court by refusing to grant LGBT couples their legal right to marry. But in the end, it was the women who came forward to tell their stories of being abused who turned the tables on him–including one woman who said the holier-than-thou evangelical forced himself on her when he was a district attorney, and she was just 14 years old. Moore’s response to these calls for justice was to smear the women as liars and double down on his nauseating bigotry. This election was about far more than vote in Alabama for a Senate seat. It was a test of support for Republican monsters like Moore, their bigoted policies and the presidency of Donald Trump. MOORE’S CAMPAIGN presented itself as a referendum on the Trump administration–and threatened that the Republicans’ big plans for next year would be in peril if he lost. “If they can beat [Moore], they can beat [Trump’s] agenda, because Judge Moore stands with Donald Trump and his agenda,” Moore strategist Dean Young told ABC’s This Week. Sections of the Republican Party fled from Moore, including Senate Majority Leader Mitch McConnell and Alabama’s longtime senior senator Richard Shelby, who said he cast his vote for a write-in candidate instead of Moore. But not Trump. Though the president reluctantly campaigned for the GOP establishment’s choice, Luther Strange, Moore’s opponent in the Republican primary earlier this year, Trump eagerly jumped on board when Moore became the nominee–despite the allegations of sexual harassment. Trump recorded a robo-call for the candidate and made an appearance at a pro-Moore rally in Florida–the day before he was scheduled to visit the new Mississippi Civil Rights Museum, no less. Former Trump White House adviser and alt-right celebrity Steve Bannon has also been a fixture of the Moore campaign. Trump and Moore have a lot in common. Like trying to silence women who accuse them of sexual assault. Trump’s refusal to go along with Republican Party leaders and continue promoting Moore was a calculated pushback against the #MeToo campaign and its hundreds of women stepping out of the shadows to tell their stories of abuse and, in some cases, bring down their abusers. At first, the Republican National Committee withdrew its support for Moore’s campaign when the allegations of sexual assault emerged. But it flipped on that decision after Trump decided to continue endorsing Moore. BUT THAT wasn’t enough to push Moore over the top. With absentee ballots still to be counted, Jones had defeated the Republican candidate by some 20,000 votes, with about a dozen counties that voted for Trump over Hillary Clinton in the 2016 presidential election switching over to the Democrats in this race. The margin of victory for Jones is about the same as the number of voters who wrote in another candidate. As FiveThirtyEight.org pointed out, of all Alabama senate races since 1990, only the 2014 race, in which Jeff Sessions ran uncontested, had a higher share of write-in votes. But while the media will focus on this number, Jones built up his margin of victory in counties with major cities like Birmingham and Huntsville, where African Americans especially voted overwhelmingly for him. Jones also had a stronger advantage among women and younger voters, according to exit polls. 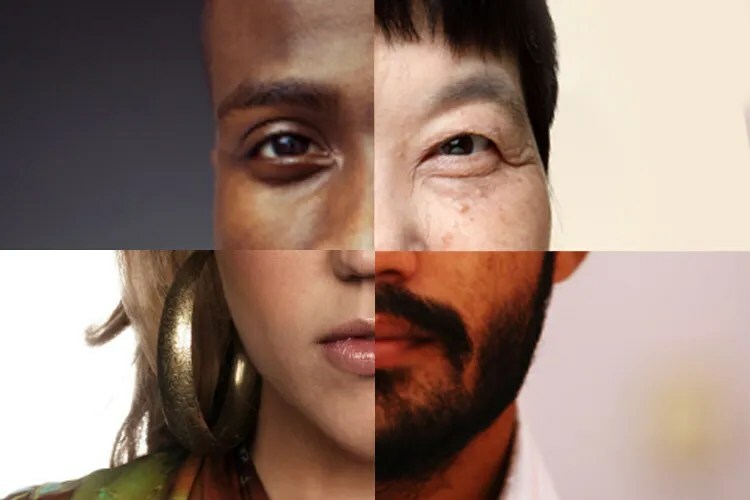 The label “identity politics” is applied to a range of positions and practices, the key unifying features of which are sectional approaches to challenging oppression and the prioritisation of subjective experience. These can be highly theorised or simply reflect a common sense based on what seem like readily observable truths: that the world is divided between people who suffer oppression and those who do not, and that group interests flow from multiple sectional divides. For example, the fact women are oppressed makes men at best constitutionally disinterested in women’s liberation or at worst culpable in their oppression. So it goes for other forms of oppression. The way in which identity politics is expressed changes over time. In the 1960s separatism was a key manifestation, in particular among women and, later, lesbian women. Marcus Garvey’s Pan-African movement, which encouraged Blacks in the US to return to Africa to be free of racism, was an earlier example of a similar political outlook. Today, separatism doesn’t attract much support. Much more widespread is a form of identity politics in which experience (often emphasised with the entirely superfluous adjective “lived”) is accorded primacy, endowing an unquestionable validity upon the subjects and their analytical and strategic approach to oppression. Two recent examples demonstrate this point of view. Enough equivocation: the left must campaign to Stop Brexit! Opinion polling on 10-11 October showed 64% saying that the Tory government is doing “badly” in negotiating Brexit, and only 21% saying it is doing “well”. 47% said that, with hindsight, they thought the vote for Brexit in June 2016 was wrong, 40% that it was right. Only a small minority say that Brexit will make Britain better off economically — only 23% overall, and only 12% of Labour voters. 44% think Brexit will make Britain worse off. 39% expect Brexit to be bad for jobs, just 22% think it will be good. 31% expect Britain to be bad for the NHS, 25% good. Among Labour voters, 51% expect “bad for the NHS”, 17% good. Meanwhile the Tories’ talks with the EU are going badly. On Thursday 19th and Friday 20th ministers, and then chiefs, from the 27 other EU states will hear a report from Brexit negotiations after five rounds of talks. The EU 27 are insisting that the UK must promise a clear list of closing-the-account payments before they will even start discussing a new deal on trade. That new deal itself will be difficult. Canada’s trade deal with the EU, with much less baggage to impede it, took eight years to negotiate and ratify, and nearly collapsed. There is no sign of progress towards the trade deals with other countries which the Brexiters airily promised back in 2016. With right-wing nationalists like Trump gaining ground in many countries, the terrain is more difficult for such deals. All that should be a signal for the left and the labour movement to start a drive to stop Brexit. We should oppose and harry the Tories at every point. We should demand — as some pro-EU Tories are already demanding — that any exit deal must be voted on by Parliament. Not just in the my-way-or-the-highway alternative the Tories are offering — their deal or a crash exit with no deal at all. And not just by Parliament. The June 2016 referendum had the defects of all referenda — a poor form of democracy. It was biased because 16-17 year olds and EU citizens resident in Britain were denied votes. It was run in a way which artificially limited the mass media debate to a Tory-vs-Tory contest. And on top of all that, it was a one-off vote about a very vaguely-sketched alternative. Democracy means stopping elites like the Tories grabbing full power to make and shape things to their own liking from such vague mandates. The populace must retain its say. Minorities must retain a chance to become majorities. Given we’ve already had the first referendum, probably the only way to stop the Tories trashing people’s rights is a second referendum. “A Labour MP”, quoted by the Financial Times on 17 October, said: “the public would need another vote on whether to go ahead, given that the Leave camp had offered a more positive manifesto [than any possible exit deal] in June 2016… It would be a ‘final say’ now that we know the facts. The people would want to have the final say over all of this”. That MP also told the FT: “this would not be a ‘second referendum’, despite all appearances to the contrary”. Huh? It would be second, and it would be a referendum, wouldn’t it? In any case, the MP is right. We didn’t want the first referendum, but now it’s happened we must demand a “final say” for the populace. 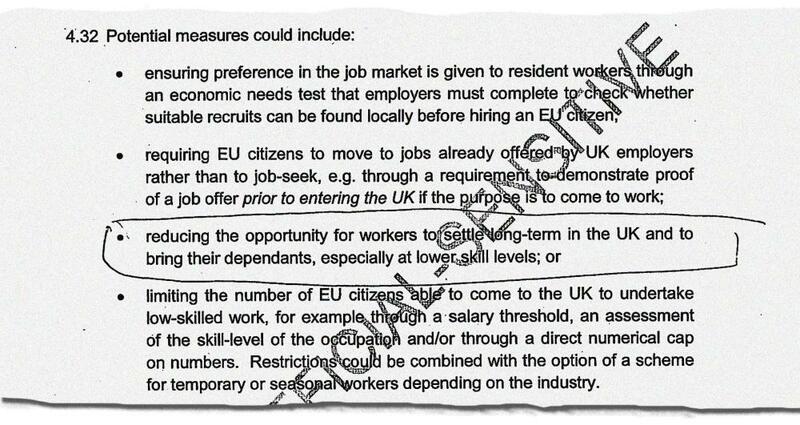 The alternative is to let the Tories have their way unchecked, to let them cancel the rights of EU citizens and of British citizens to be able to work and study in the EU, to let them make difficult-to-reverse decisions, all on the authority of an old referendum and the Parliamentary majority of a moment. 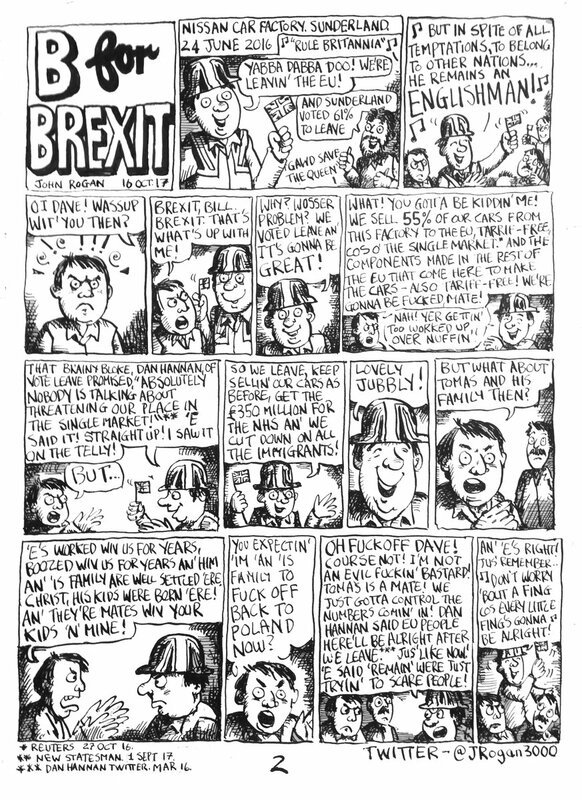 Our basic guideline should be working-class solidarity and social levelling-up across borders. Immediately, we should also be backing French workers in their battle against the very pro-EU but anti-worker Macron government. Also, however, we cannot let the immediate issue of the re-raising of economic and social barriers, and the suppression of rights to free movement, wait on the general and longer-term issue of reorienting the labour movement towards a workers’ Europe. “Stop Brexit” and “Second referendum on any exit deal” should be immediate slogans, alongside “Freedom of movement”. On 12 October, Jeremy Corbyn said that he would vote Remain in a second referendum, but in these terms: “There isn’t going to be another referendum, so it’s a hypothetical question but yes, I voted remain because I thought the best option was to remain. I haven’t changed my mind on that”. Last week I met by chance, on a bus, a member of Corbyn’s inner circle, someone I’ve known for decades. I can’t quote him by name, because it was a conversation on a bus, not an on-the-record interview. But those who have followed Labour statements on Brexit will recognise his responses as only a snappier and more candid rendering of the official line. What should Labour do about Brexit? Response: oppose the Tories, criticise the Tories at every step, wait and see, and avoid further commitment. What if the Tory government falls before it can complete a deal? Won’t Labour then have to say something definite? Response: long silence. Then: “That would be very difficult”. The Corbynista insider was sure of one thing: Labour cannot, must not, come out for stopping Brexit. Labour must equivocate in order to keep both its pro-Brexit and its anti-Brexit supporters on board. This craven, manipulative approach to politics is incompatible with socialism, and unlikely to work in the long or even medium term. Tens of thousands joined a “Stop Brexit” march at the Tory party conference on 1 October in Manchester — some of them chiming in with pro-EU Tories like Stephen Dorrell, some of them going on to join the anti-austerity march the same day. So far there’s still a majority for the resigned view: Brexit will be not very good, or positively bad, but now we just have to go through with it. That majority is beginning to break up. Probably it will wane and wax in the next months and years as the talks between the Tories and EU go worse or better. A determined drive by the left and the labour movement can and should turn the majority into a minority, and stop Brexit.